I was reminded, yet again, last week about the power that comes from overtly answering the “why?” question. 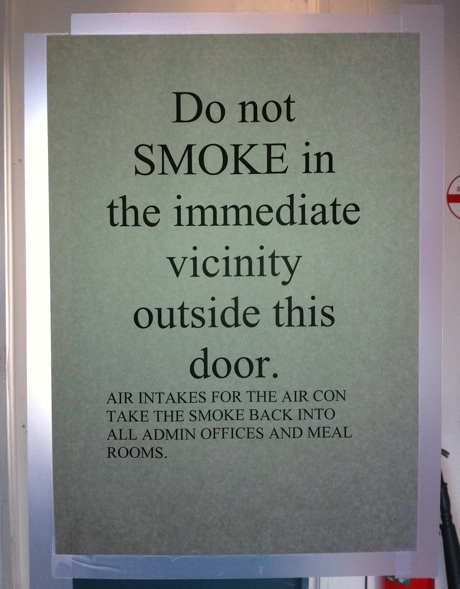 The explanation below the main text makes this poster far stronger as an influence tool and more likely to stop people smoking directly outside the door. Why? It gives a reason not to smoke in that place. The power of giving a reason was highlighted in research by Harvard psychologist Ellen Langer as far back as 1978. She undertook a very simple experiment with students queuing up to use a library photocopier. When students were asked; “Excuse me, I have five pages, may I use the machine?” 60% agreed to the request; 40%, however, said no and continued with their own copying. When a reason was added; “Excuse me, I have five pages, may I use the photocopier, I’m in a rush” – 94% percent agreed to the request. However, what doesn’t make sense is why the same number agreed when the request was changed to “Excuse me, may I use the photcopier because I want to make copies.” This reasoning doesn’t really make sense. Why would you use a photocopier if you were not planning to make copies? It is the same as no reason at all. Langer therefore concluded that the key difference to whether the majority of people would agree to a request or not, was if a reason was attached to the request. If people at least tried to address the “why?” question. Now I believe that any reason is fine, even it doesn’t make sense, when you are asking a stranger for a one off favour. But when it comes to influencing behaviour on an ongoing basis in our homes and workplaces, the reason itself also becomes important. Dan Pink has a whole section on his website about posters like this, which he calls emotionally intelligent signage that is well worth checking out. For such a simple poster, it really does a great job of answering the “why?” question and positively impacting behaviour.